Of the 126 of the 130 votes that Curry received were for first place and second place. Oddly enough, it wasn’t the three third place votes that were the lowest, but Curry somehow received one completely ridiculous fifth place vote. It turns out that Mike Crispino, the New York Knicks radio guy, was the fool that put Curry in fifth place, behind Harden, Westbrook, James and Grizzlies center Marc Gasol. Crispino clearly lacks sense, objectivity or both. The NBA should investigate his previous votes ASAP. In a day and age when a player’s efficiency is being valued like never before, it’s not even close when it comes to Curry v. Harden (48.7% overall shooting for Curry to 44% for Harden; 44.2% from three-point range to 37.8%; a league-leading 91.4% from the free-throw line for Curry to 86.6% for Harden). Harden is vastly superior when it comes to getting to the line (9.9 attempts per 36 to Curry’s 4.7), which helps cut the gap between those two players in true shooting percentage, which takes two-pointers, three-pointers and free throws into account (63.8% for Curry and 60.5% for Harden). You know, he’s doing this for the best team in the entire league. In terms of combining impact and efficiency, he is on the verge of averaging 23-plus points, seven-plus assists, four-plus rebounds per game while shooting 40-plus percent from three-point range for the second time in his career. That mark – according to basketball-reference.com – has only been reached by two others: LeBron James (2012-13) and Larry Bird (1986-87). But make no mistake, the Warriors are a far worse team when he’s not on the floor. The plus-minus point swing of plus-18.9 when Curry is on the floor vs. on the bench is the second-best of the MVP candidates, with Paul leading in that category (plus-19.6), James third (plus-16), Davis fourth (11.2), Harden fifth (plus-8.2) and Westbrook sixth (plus-6.4). Curry’s long-range game is on track to go down as the greatest of all time, as he recently broke his own single-season record for three-pointers (281 and counting) and now has three of the top five single-season marks in league history (Ray Allen and Dennis Scott have the others). 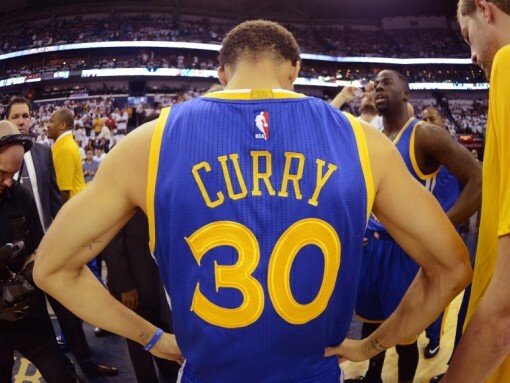 Curry leads the league in win shares per 48 minutes (.290), a statistic that – as basketball-reference.com describes it – estimates the number of wins contributed by a player per 48 minutes. Steph Curry broke his own record for threes made in a season. While shooting 44% from distance.